This classic Chapel Hill wedding was certainly a dreamy, beautiful day… and I’m not kidding when I say how joyful, love-filled, and incredible it was! Caroline and John are one of those dream couples to work with, and I absolutely loved getting to know these two and their marvelous families over the many months we planned their wedding. Caroline and John have the most giving, calm, kind spirits, and it has been such a deep pleasure to bring their beautiful, meaningful wedding day to life! They love each other, their family and friends, and the Lord so deeply, and this love radiated throughout their entire wedding weekend. They care for others so much! Caroline and John also have the best style, which made planning a wedding with them a total dream. I love how classic and timeless their aesthetic is – but it was also very fresh and with so many personalized, special touches throughout. Their entire wedding (and its design) reflected them as a couple, and the design was so thoughtfully chosen. You can really see their personalities, passions, and style in every detail, big and small, and it was also so apparent how happy they were to be getting married and celebrating with all of their family and friends! -Caroline and her beautiful bridesmaids and her mom getting ready on the wedding day! Seeing their excitement and sheer joy (Caroline included, of course!) was something I simply love… and when Caroline stepped into her seriously GORGEOUS gown… jaws dropped. She is such a radiant, stunning bride… and I simply couldn’t wait for John to see her! -I also loved how classic and timeless Caroline’s entire wedding look was (that lace! the back of her dress! all of it! )… but that she was super excited about her gold glitter Kate Spade heels! Traditional and elegant but with such a fun pop! -John also cares for others so much… at one point during wedding planning, he emailed me himself just to say thank you. It was one of the most touching emails I’ve ever received as a wedding planner, and it was such a touching, thoughtful, gratitude-filled email! -I spent months planning and design this wedding with Caroline and her amazing mom, Kim, and they were truly the best to work with. Lots of thought went into the design, logistics, and overall planning, and these two made it so easy! I absolutely loved getting to know them so well, and they were always putting others first. This whole family was simply amazing. 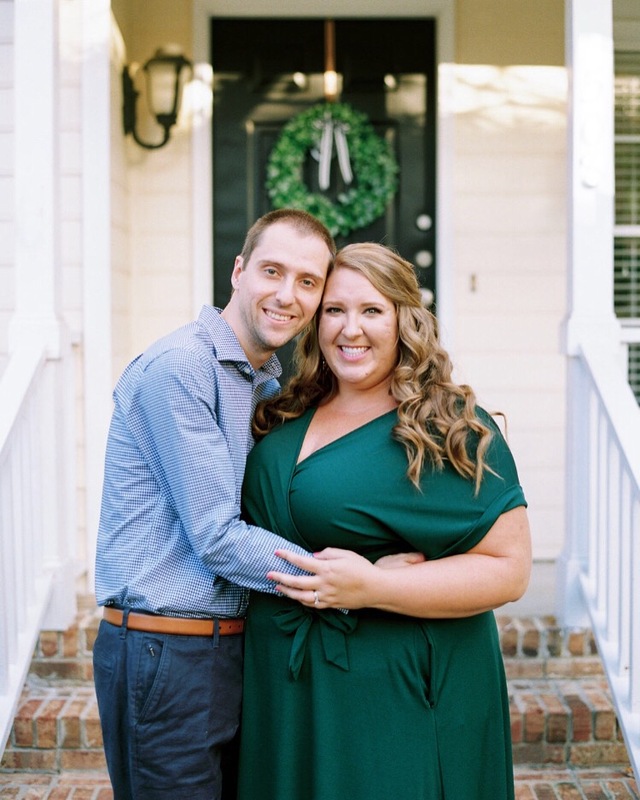 -Their faith and love for the Lord was just so incredibly apparent and palpable… getting married in the church Caroline grew up in, and where John served, and where they attended during college. The ceremony!! Cue all the happy tears. Their favors – giving back to their favorite charities and non-profits. How they treated all of their family, friends, and vendors. -Caroline and her dad’s dance – serious skills right there!! -Their beautiful, fun sparkler exit and send-off in the most classic, elegant antique car (her parent’s neighbor’s!). What a fairy tale, gorgeous, amazing wedding day!! -And last but not least… their wedding day was also the day I got engaged! I definitely was not expecting my own proposal that day (after working 12 hours at a wedding! )… but my fabulous fiance surprised me and proposed when I got back to my home after their wedding! It’s so fun sharing our engagement date with their wedding. And y’all, the texts these two sent me when we announced the news the next day – priceless! They had just landed for their honeymoon when our happy news popped up on FB. Their texts were full of so much joy, and Caroline said she burst into happy tears on the plane! I cried just reading their sweet messages (and subsequent card and gifts). I can’t tell you enough just how WONDERFUL and loving and fun these two are!! Congratulations, Caroline and John! May the Lord bless with you a lifetime of love, laughter, and all the joy in the world together!! A huge thanks to the absolutely phenomenal vendor team who made this day come to life so beautifully and effortlessly! Calligraphy by the bride, Caroline! PS: There were a million stunning pictures I want to share from their wedding day, but that would be the longest post in the world! Enjoy these! !